The house known as Somerset, at 93 Cramer Street, Preston, constructed c.1915, is significant. It is a is a substantial single-storey Edwardian villa set back from the street behind a mature garden. The house is built of brick and has a hipped and gabled roof with slate tile roofing. There is a terracotta finial and terracotta ridge capping on the roofs. The tall brick chimneys of the house have terracotta chimney pots. A bay projects towards the street at one side of the street facing elevation and a verandah with a timber frieze and brackets continues across the remainder of this facade, and another bay projects from the side of the house. The front door has sidelights and highlights, and the windows are timber double hung sash. The front fence, outbuildings and later alterations and additions to the house are not significant. 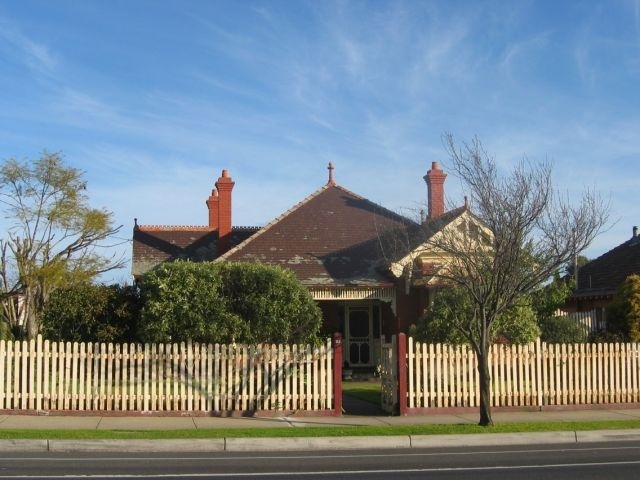 The house, Somerset, at 93 Cramer Street, Preston is of local historic and architectural significance to Darebin City. The house at 93 Cramer Street, Preston is a substantial single-storey Edwardian villa set back from the street behind a mature garden. The house is built of brick and has a hipped and gabled roof with slate tile roofing. There is a terracotta finial and terracotta ridge capping on the roofs. The tall brick chimneys of the house have terracotta chimney pots. A bay projects towards the street at one side of the street facing elevation and a verandah with a timber frieze and brackets continues across the remainder of this facade, and another bay projects from the side of the house. The front door has sidelights and highlights, and the windows are timber double hung sash. The house is relatively intact and is in reasonably good condition. A timber palisade fence, of a design typical of the Edwardian period but possibly of more recent construction, extends along the street boundary.